Luscious Life & Decor: A Bowl Full of Love! I love little bowls, as mentioned in previous posts, not just to hold cereal, but lots of other things. I love them to hold jewelry, change, hair accessories, matches, and so on. I use them in a variety of places, such as on our console table, in our kitchen, on our nightstands, and on my vanity. I use these white ones from Pier 1 to hold earrings I wear often and small bobby pins, etc. 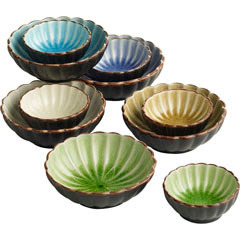 These little seashell bowls are only $1 each so you don't feel guilty stocking up on a few. LOVE these floral bowls! 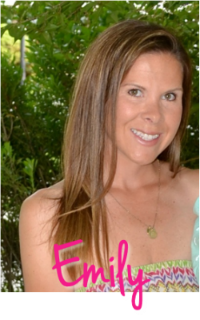 So pretty and are so versatile. Use to hold jewelry or office accessories. If you're having a dinner party, wash it and use as a serving dish. Check online here for the Anthropologie bowls in addition to many other beautiful dining pieces! I hope this gives you inspiration to look for pretty little bowls to put around your home for a variety of uses. Plus, you don't have to break the bank for bowls, and you can always look at consignment shops, as well. I like unique bowls and mixing and matching. thanks for posting this! i went to pier one today and bought a couple of the bowls that are brown on outside/color inside. they're so pretty and perfect to put on my dresser to throw my jewelry in. great post!